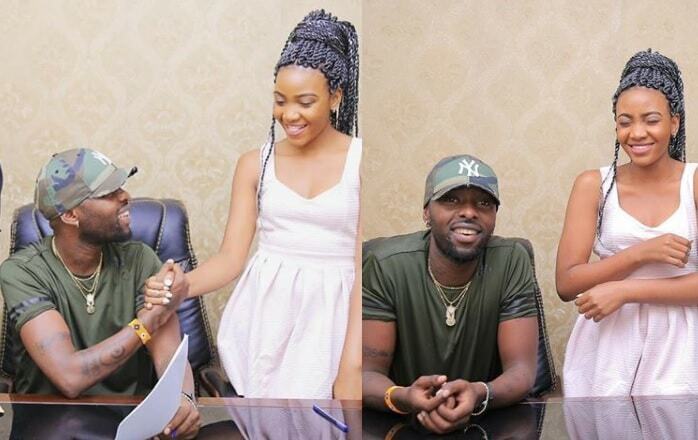 Eddy Kenzo has signed a new talent to his Big Talent Crew in Tracy Kirabo, 22, going by her stage name, Pia Pounds. Pia has been around and done a few songs, though, she's been concentrating more on her studies. Now that she's in the final leg of her Business and Management course at the International University of East Africa (IUEA), she has decided to bounce back to music. Kenzo landed on her a few days back when she was recording one of her songs, he also advised her on a few changes in the song. They put pen on paper last week and Tracy could not hide her excitement. "No one can understand how happy I am today. I thank the almighty for the abundance in favor that overwhelms upon my head. I thank the almighty for the day @eddykenzo recognized me. Father, please guide me into glory, this has been a dream for so long." Pia Pounds will be premiering her first song under the Big Talent Crew tomorrow, she will also perform at Guvnor. "I am so happy to be part of a family that never fails, I feel so special to be recognized by one man I looked up to for so long. He inspires me, my mentor, my papa. I am indeed feeling more than blessed for this opportunity."